THAT'S SO RADICCHIO Bitter vegetables take some getting used to, but they are quite versatile and nutritious. At an airport salad bar in Rome recently, I filled a plate with leaves. It was a basic cafeteria salad bar, one that, in the States, would probably be dominated by a large bin of iceberg lettuce laced with carrot shavings. But instead of lettuce, the leaves were chopped escarole and radicchio. Dressed with oil and vinegar, they were crisp and watery. And they were bitter, a taste I have been coming to appreciate. 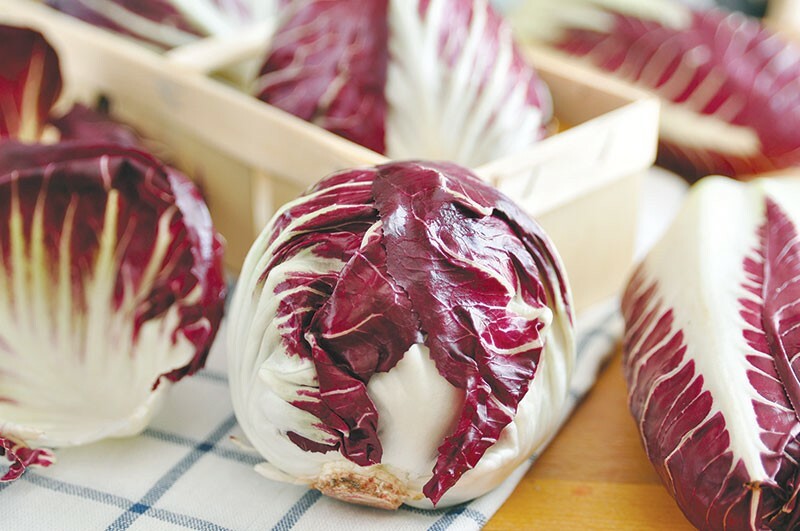 The Italians are ahead of the curve when it comes to eating chicory, the family of bitter-leafed plants that also includes endive and dandelion. At various stores and markets on my trip, I picked up several seed packets of different chicories, like the stately, thick-stemmed Catalogna that looks like a dandelion on steroids, or the Rossa di Treviso, a leafy radicchio shaped more like romaine than the typical tight radicchio head. These and several other equally interesting varieties would become the basis, when I returned home, of the chicory project. The chicory project, which also includes Italian chicories ordered from GourmetSeed.com, is now fully underway at an area farm. We are investigating which varieties do well in our climate, while playing with different ways of serving it that might appeal to the locals. This last part is kind of a tall order, as we are programmed to reject bitterness from an early age. Newborns will scowl at the taste, and for good reason: most toxic substances are bitter. Our default status is to avoid bitter flavors until we learn otherwise. Like, say, when we learn about beer, or mixed drinks that contain bitters. Or coffee. Or chocolate. Or something charred on the grill. The American palate is catching on to the dark flavor of bitter. Dark chocolate is increasingly popular. Dark-roasted coffee is all the rage. But how dark is too dark? We all have our own comfort zone. I personally think dark-roasted coffee tastes burnt, and so I always order the lightest roast. Similarly, I don't like my food blackened on the grill. Many bitter flavors from plants come from the presence of glucosinolates, and other plant defense compounds, that are toxic to insects and worms and other hungry critters. But at the levels we humans consume, these molecules are not dangerous, and are showing promise in actually preventing a variety of diseases. The bitter leaves tend to be stacked with other nutrients as well, like folate, and various antioxidants, along with readily accessible forms of minerals. The best way to deal with these and other bitter foods is to embrace them, head on, and celebrate them for what they are. There are all kinds of interesting recipes out there for braised radicchio, wilted escarole, endive torte and others varieties. Enthusiasts of cooked chicory praise how it mellows the flavor and how it adds to sauces. But after adapting my palate to the crisp texture of the raw stuff, I have no interest in soggy chicory. And I don't want to mellow the flavor anyway, because I'm into bitter. I've acquired the taste, and I can go there by myself without training wheels. I'm a chicory grownup.